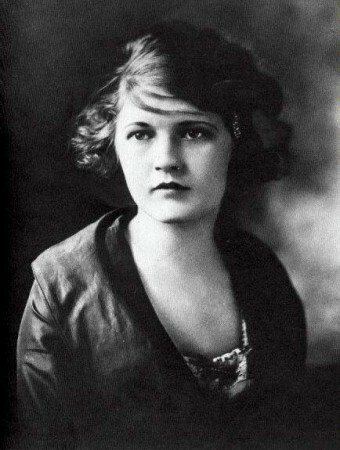 Today I found out about the life of Zelda Sayre Fitzgerald, the wife of famous writer F. Scott Fitzgerald and who the video game character of “Zelda” was named after. Zelda Sayre was born in Montgomery, Alabama in 1900. She was named for characters in two different books, Zelda: A Tale of the Massachusetts Colony and Zelda’s Fortune, both of which feature gypsies as the title character. Her family was entrenched in the United States government; her father was a judge for the Supreme Court of Alabama and her great-uncle served in the United States Senate, as did her maternal grandfather. That said, it’s probable that Zelda was doing more than seeing how much gossip she could create. She truly believed in the radical idea that women should be more than just daughters and wives. She wanted women to have the same rights as men, and she liked to test her boundaries as a woman. At the age of 18, she met one F. Scott Fitzgerald at a country club dance. He was stationed near Montgomery as a second lieutenant in the infantry and had yet to make it big in the literary world. In Zelda, he found a muse and more, but she was largely unimpressed with his financial prospects. Nevertheless, the pair started up a long-distance correspondence when Fitzgerald returned to New York, though he was aware that she was seeing other men. Two years after their initial meeting, Fitzgerald’s first novel, This Side of Paradise, was picked up by Scribner’s. After it was accepted to be published, F. Scott wrote the publisher stating that he would like the book to be published as quickly as possible as “I have so many things dependent on its success—including of course a girl.” It worked; after he sent a message to Zelda telling her that he had a book about to be published, she immediately accepted his proposal for marriage. Just a few weeks after its publication, Zelda and F. Scott got married. His first book made him rich within a year after its publication, and Zelda was able to escape the relatively restricted life she led in Alabama for the glamour of New York and, later, Europe. There were other issues, too. In 1924 while Scott worked on The Great Gatsby, arguably one of his most popular books, Zelda’s eyes reportedly began to wander to a pilot named Edouard Jozan. She spent much of her time with him and, after just a few weeks, asked Scott for a divorce. He locked her out of the house until she stopped requesting one. After the affair, Zelda’s behaviour became more erratic than simply contradictory to societal norms. Shortly after the incident, she overdosed on sleeping pills—whether accidentally or in an attempt to commit suicide it isn’t known. She survived to see her husband become friends with Ernest Hemingway, a relationship she despised. She later accused them both of being homosexual, though there was no evidence of it. In response, Fitzgerald hired a prostitute for the night to prove his manliness while Hemingway accused Zelda of being “crazy.” A little while later, she might have proved his point about being crazy. She threw herself down a flight of stairs at a party where her husband was too preoccupied with dancer Isadora Duncan to pay attention to her. Part of Zelda’s anger about the interaction with Isadora Duncan might have been that she desperately wanted to carve a creative path for herself that was separate from her husband’s. At the age of 27, she was preoccupied with her desire to become a ballerina. She practiced eight hours a day, exhausting herself, and as a result her health deteriorated. She had a “mental breakdown” at the age of 30 which was blamed on the training, though likely her failing marriage had something to do with it as well. Plus, Scott was becoming increasingly alcoholic. Whatever the case, she was admitted to a sanatorium in France and later moved to one in Switzerland. Doctors diagnosed her with schizophrenia, but whether she actually had a mental illness is up for debate. Some of her biographers paint her as a victim of a patriarchal society, and that Scott was trying to silence her creativity so that he could use her material himself. Indeed, when Zelda tried her hand at writing during her second stint in a mental institution—this time in the United States shortly after her father died—Scott became angry. The book titled Save me the Waltz, which Scribner published in 1932, drew heavily on her life with Scott. The main characters mirror the pair’s own relationship with a few details changed. Scott had been intending to use much of the same material for his novel, Tender is the Night, published in 1934. He scoffed at her attempt to write and was likely pleased when her book didn’t sell very well. Zelda, meanwhile, was devastated. Paintings by the almost mythical Zelda Fitzgerald; with whatever emotional overtones or associations may remain from the so-called Jazz Age. Zelda’s and Scott’s relationship remained understandably rocky. He was off in Hollywood most of the time, carrying on an affair with Sheilah Graham, a movie columnist. She was once again in a mental institution—this time in Asheville, North Carolina. Zelda “made progress” in Asheville, and in 1938 Scott had a falling-out with Graham, resulting in husband and wife taking a trip to Cuba. They returned from the trip exhausted, and Scott returned to Hollywood. The pair continued sending each other letters, but it was the last time they would see each other. In 1940, Scott died. Due to their diminished financial situation in their later years, Zelda was unable to attend his funeral. She did get her hands on his last manuscript, The Love of the Last Tycoon, which she managed to get published for him. She was also working on a second book of her own at the time, though she would never finish it. Zelda returned to Asheville where she underwent additional therapy, and was locked in her room on the night of March 10, 1948. All we know is that a fire started in the kitchen—there are conspiracy theories that a disgruntled nurse started it but there isn’t any proof—and spread via the dumbwaiter system to every floor. Unable to escape, Zelda perished in the flames with eight other women. I think (short of documentary evidence to the contrary) that if people are not crazy, they get themselves out of crazy situations, so I have never been able to buy the notion that it was my father’s drinking which led her to the sanitarium. Nor do I think she led him to the drinking. Whatever the case, though the pair had fallen from fame at the time of their deaths, their work saw a resurgence in later years. Hollywood is still remaking The Great Gatsby movies, Zelda’s image has become that of the quintessential 1920s flapper, and Zelda’s name was borrowed by Shigeru Miyamoto for the well-known Legend of Zelda. The pair are also the subject of a museum in Montgomery where Zelda’s paintings are kept on display. What a sad story. It sounds like these two people were not right for each other – they both wanted to be the center of attention and so made each other miserable.